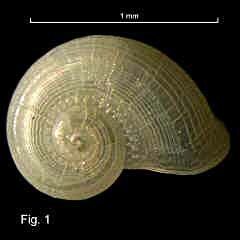 Description: Shell minute, spire flat or very low. Protoconch of 1½ smooth whorl. 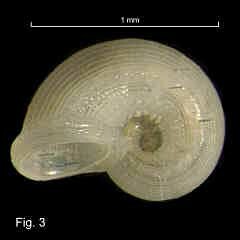 Teleoconch of 1-1¼ whorls. Last whorl shouldered, flat above shoulder, rounded below. Spiral sculpture of a strong spiral cord at shoulder and another at base, and fine spiral threads, about 8 on flat zone above shoulder and 20 between shoulder and base. Axial sculpture of irregularly spaced riblets, forming beads below suture and on major spirals. Umbilicus widely open with coarsely beaded cords within. Aperture circular, with a strong, smooth varix. Colour translucent white. Size: Typically 0.7 mm high, 1.2 mm wide. Distribution: Endemic to Australia; Masthead Island, Queensland, southwards to Tasmania and South Australia. Habitat: Most specimens are empty shells from beach washup, but a few are dredged down to 104 m. Live specimens are known from among coralline algae intertidally. Moderately common. Remarks: The range given by Jansen (1995) is incorrect. She reported the species from southern Queensland to southern NSW, but there are specimens and literature records from Victoria, South Australia and Tasmania. The type locality is Brighton, Western Port, Victoria! 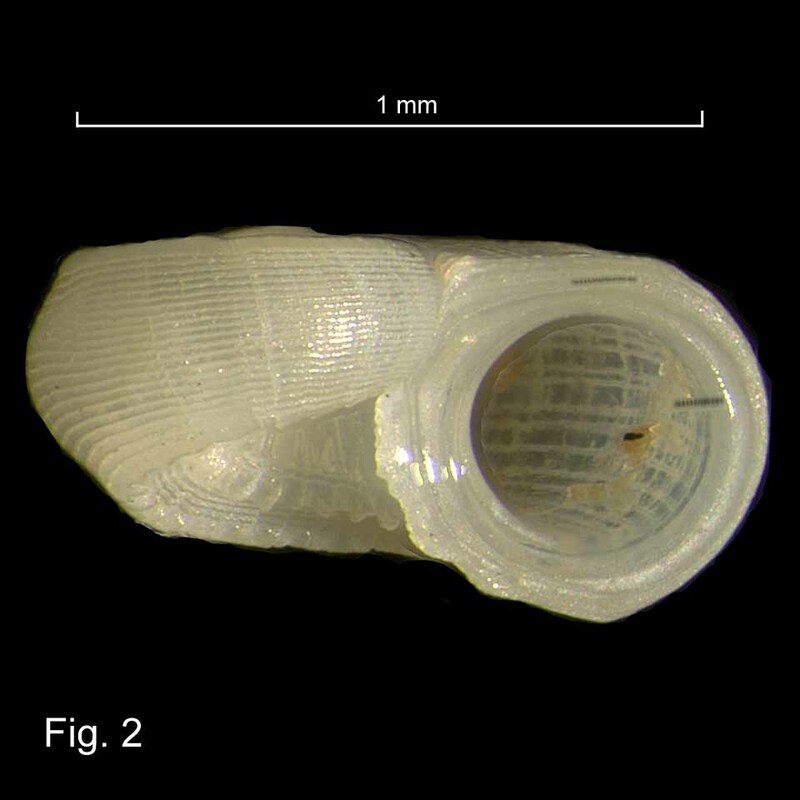 Warén (1992) figured the shell and radula of this species.